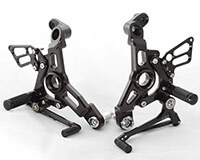 Fits SATO RACING REAR SETS for DUCATI MONSTER 696 / 796 / 1100 (non-EVO models). Black anodized billet aluminum brackets with chrome molybdenum bolts. Use with stock passenger pegs.